Lesson 4 why these whole number ratios exist for a musical instrument. rather a pattern of a wave. Thus, it does not consist of crests and troughs, but rather nodes and antinodes. for the ﬁrst harmonic or fundamental frequency of a guitar string. The diagram below depicts this lengthwavelength relationship for the fundamental frequency of a guitar string. frequency of a guitar string. string can be algebraically derived. of the second harmonic (denoted by the symbol λ2) would be 0.8 m (the same as the length of the string). can be used to determine the frequency of the second harmonic (denoted by the symbol f2). to determine the frequency of the third harmonic (denoted by the symbol f3). harmonic have a 5:4 frequency ratio(http://www.physicsclassroom.com/Class/sound/u11l2a.cfm#table). variety of frequencies sounding out in the mixture, then the timbre of the sound is rather rich in quality. 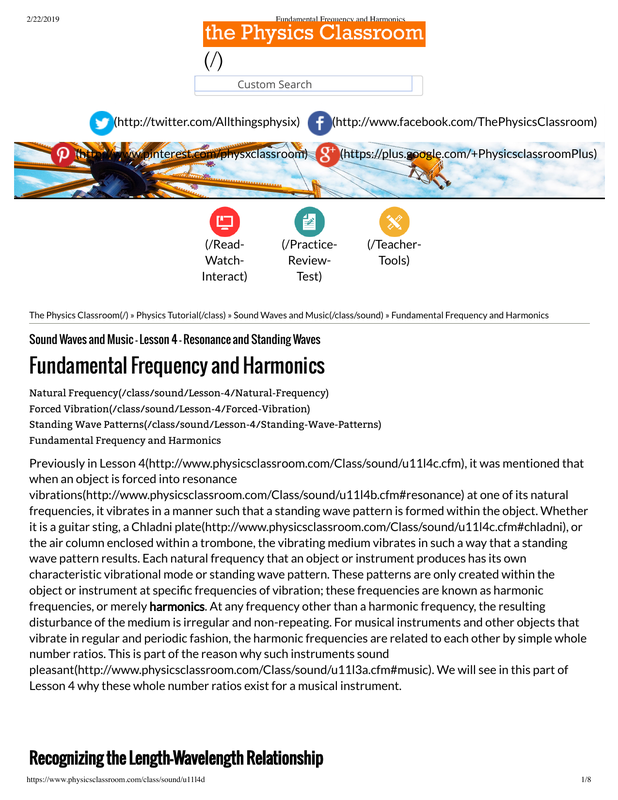 resonance and standing waves will be applied to other types of instruments besides guitar strings. investigate this principle. Use the frequencies provided and try some combinations of your own.